LOUISVILLE, KY. — Former New York Giants QB, Phil Simms, has been named the guest speaker at the U of L Conversations With Champions event to be held on Wednesday, Aug. 27, at 7 p.m. in Comstock Hall on U of L’s Belknap Campus. Simms speech will address how mentors helped him develop leadership skills as well as how he has handled the pressures that come with being an NFL quarterback and television sports analyst. Conversations With Champions will be integrated into curriculum for the university’s sport administration program, which is part of the College of Education & Human Development. Source: U of L News Release. 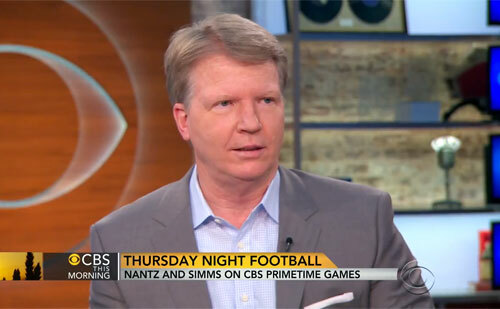 Photo shows CBS Sports NFL analyst Phil Simms speaking on CBS’s Thursday Night Football May 2014. Sports journalist Billy Reed, who is a U of L adjunct faculty member, will moderate the discussion. “Phil has risen from modest circumstances to go from the South End of Louisville to the Super Bowl, and I think his fascinating story will resonate with students,” Reed said in the release. Reed was part of a similar program at Georgetown College in Georgetown, Ky., for two years. The program series featuring well-known sports figures will be open to the public. There is no charge to attend, according to the release, but reservations are required. Parking will be available at no charge in a lot between the College of Business and the School of Music. Simms was the New York Giants’ quarterback for 15 years and led the team to two Super Bowl titles. He is a graduate of Jefferson County Public Schools’ Southern High School and Morehead State University in Morehead, Ky. He has been a sports analyst for CBS since 1998. If you would like to book football speakers or athletes like Phil Simms for a speaking engagement, autograph signing, product endorsement, fundraiser or special event, contact Phil Simms’s booking agent for appearance and speaker fees at Sports Speakers 360. For booking agent and appearance fee information on how to hire New York Giants players for appearances, call 1.855.303.5450.